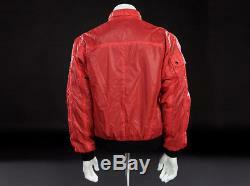 HERO SCREEN USED COBRA KAI JACKET. A rare chance to own a museum quality instantly recognizable Hollywood prop/costume. Original one of a kind screen used COBRA KAI JACKET, worn by William Zabka in his starring role as Johnny in the 1986 film The Karate Kid 2. 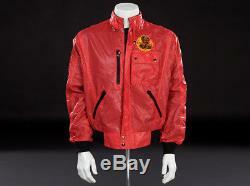 JOHNNY'S William Zabka's HERO COBRA KAI JACKET. 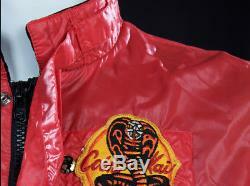 Johnny Lawrence's extremely rare iconic red Cobra Kai jacket from the sequal. Some expected usage/wear due to age and filming, but otherwise in very good condition. 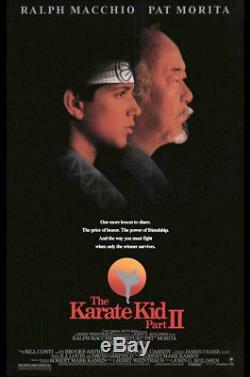 Head over the ocean to Okinawa for more high-kicking action in this sequel to the original Karate Kid. Miyagi visits his dying father and rekindles his feelings for a former flame -- which leads to a tense confrontation with an old rival -- Daniel finds love (and enemies) of his own. It all leads up to an exciting, feel-good finale you won't want to miss. Please contact me directly with any offers regarding this. The item "Johnny (William Zabka's) screen used hero Cobra Kai jacket from THE KARATE KID 2" is in sale since Sunday, April 15, 2018. This item is in the category "Entertainment Memorabilia\Movie Memorabilia\Wardrobe\Originals".